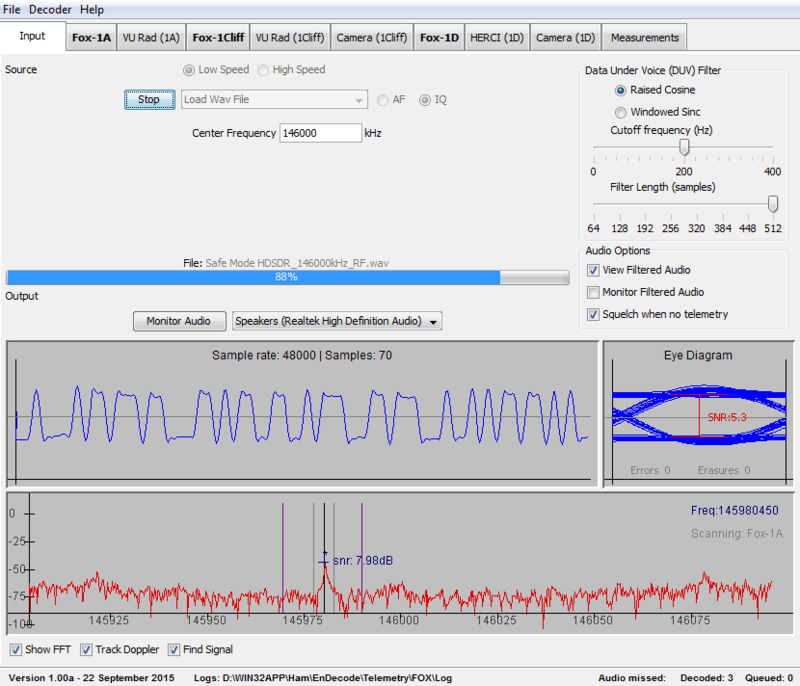 Fox Telemetry Decoder Software Version 1.0 is Available for Download. I downloaded the software to see if everything is working. I did some testing an debugging on my side. Except of the audio monitor function I got everything working with the help of the available AF and IQ recordings. The software is looking great and I am ready to received and decode the FOX satellites. used for data intensive experiments such as the Virginia Tech Camera. High Speed because it sounds like an old school computer modem. This entry was posted in FOX and tagged Telemetry by PE0SAT. Bookmark the permalink. Be sure you click “Monitor Audio.” It is a little backwards from the way many of us think. Thanks for the information – With this help I was able to get the audio monitor active. You also have to check if squelch isn’t enabled.